The monument in the centre of the city is designed around a pink triangle - the symbol gay prisoners were forced to wear in the concentration camps. As many as 15,000 people were killed for their sexuality in the Nazi camps. Similar monuments in their memory have been erected in Amsterdam, Berlin, San Francisco and Sydney. Writing on the monument in English, Hebrew and German reads: "In memory of those persecuted by the Nazi regime for their sexual orientation and gender identity." "In addition to the extermination of Europe's Jews, the Nazis committed many atrocities, in an attempt to destroy anyone who was considered different," said Tel Aviv Mayor Ron Huldai. "This monument reminds us all how important it is for us to respect every human being," he said. 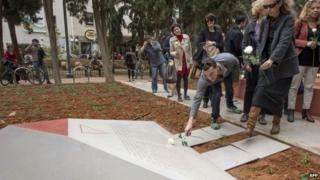 The monument, unveiled on Friday, will stand outside the Municipal LGBT Community Centre in Tel Aviv's Meir Park (Gan Meir). German ambassador Andreas Michaelis said: "It is important that we put up monuments and name streets, in order to remember things that happened in the past. But they must be first and foremost reminders for the future." The Nazis branded homosexuality an aberration threatening their perception of Germans as the master race, and the Gestapo kept a special register of around 100,000 gay people. Thousands were sent to Nazi concentration camps in the 1930s and 1940s. Tel Aviv has a vibrant gay scene and hosts an annual gay pride festival.